Have an idea for a special unique gift for someone? We have created all kinds of gifts for many different occasions like weddings, retirement, engagement, teacher appreciation and much more! Weddings, new baby, new house, retirement, thank you” whatever your event, we will assist you in creating the perfect hand-painted ceramic piece. From platters, mugs to house plaques, there is no limit to your choices. You can choose from any of our existing patterns and borders, or you can create your own pattern. We can also create one-of -a-kind invitations and other gifts in our Hestia Impressions line of hand painted watercolor products. Call us or stop by our Marblehead Studio Store to discover all your creative options. 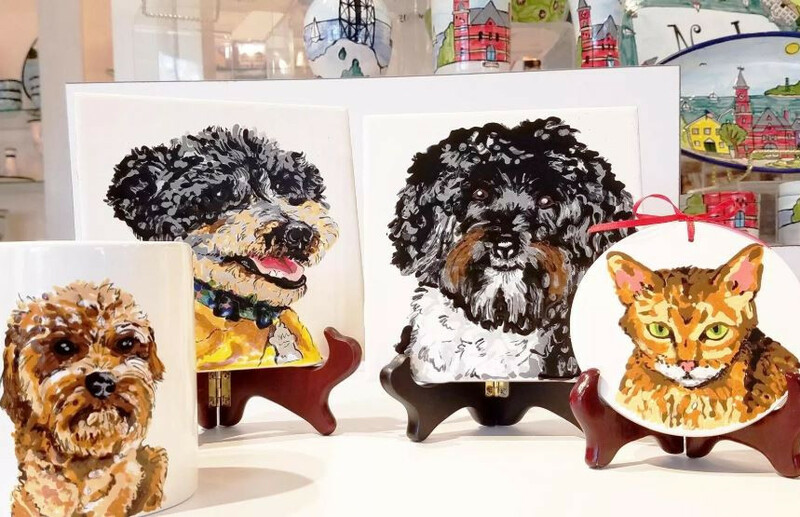 Send us a photo of your adorable pet of any variety, and we can immortalize him or her in a hand-painted portrait on a piece of ceramic of your choosing, including mugs, trivets, plates and more. Call us or visit our Marblehead Studio to purchase or for more information. We invite you to browse our online Studio Store selections to view the depth of our creativity and product lines.